These days though that’s all totally changed, with the advent of the parenting blog. It seems that as soon as cyberspace was up and running as a far-reaching forum for open and unending debate, it unleashed a maelstrom of mums (and some dads) keen to lift the lid on previously private domestic daily life. No family stone is left unturned in these bare-all blogs: husbands, kids, the grind, the losing of the mind, the joys, the highs and lows all get outed and offered up for comment. For example, A Modern Mother is written by a mother-of-two from Salt Lake City who tells it like it is, warts and all. Moaning Mum is another candid read from a “well-intentioned but frequently disillusioned wife and mother” raising two “little monsters” curiously code-named ‘Egg’ and ‘Dumpie’. In the UK Mumsnet is huge, hosting hundreds of women chatting via online message boards. Discussion ranges from kids names to what to do with a three-year old who eats only bread. 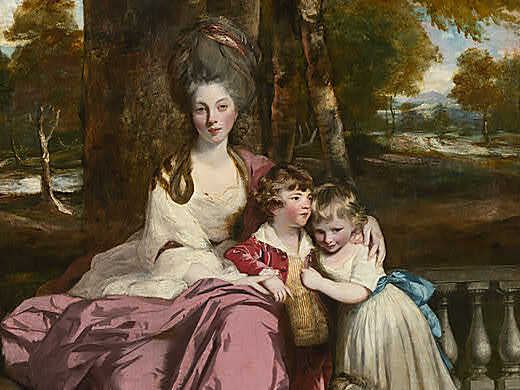 All of this unfettered and frequently TMI exposure makes the portrait I saw, Lady Elizabeth Delmé and her Children (1777 – 1779), look all the more restrained and refined. 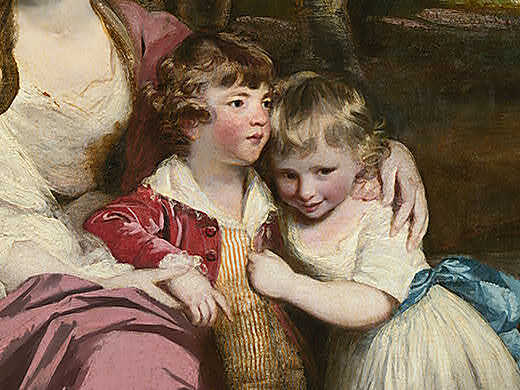 It’s by the British painter Joshua Reynolds (1723 – 1792), the most distinguished portraitist of his day. 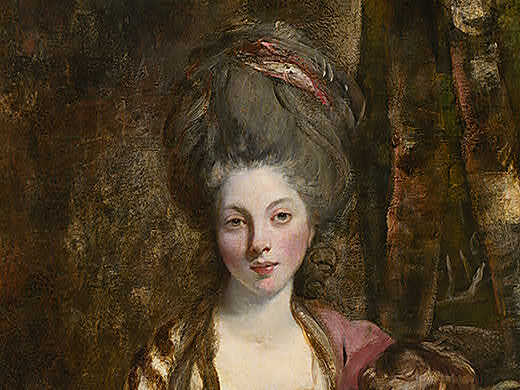 A learned art theorist, and the first president of the Royal Academy after its founding in 1768, Reynolds did more than anyone else in history to elevate the status of British art and artists. In particular, Reynolds made it his personal goal to raise the status of portraiture from lowly “face painting” to the lofty level of history painting, by making reference to the great art of the past. This plan sprang in part from his travels through Italy (Rome, Florence, Bologna and Venice) in 1750 – 52, where he made a profound study of Greek and Roman sculpture and Renaissance art. Judging by this image alone, Reynolds practised what he preached when it came to infusing his works with the fine feel of ‘classical’ art: so much about this portrait exudes old-school style. The pyramidal composition, formed by the bend of the bodies and bonded by the wrap-around arms of the mother, recalls Madonna and Child paintings by Raphael. So too the steadied poses and fluid draperies, riven with high-key contrasts of light and shade, remind of earlier, Renaissance masters. The fetching thing is, for all its balanced, classical charm, this picture is fed with a familiar feel, due to the everyday elements it contains. Reynolds was right to select certain details, to instantly make the portrait accessible and relatable. 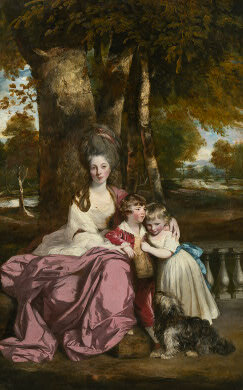 Note the natural tenderness in mum’s embrace of her boys and the strong sense of character we see in the faces. 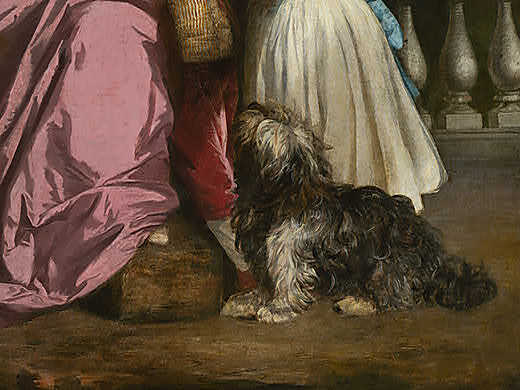 Reynolds had a real skill for reflecting his sitters’ interests through pose and expression, which extends here to the perky posture of the (playful) terrier. I get that it’s good for mums to vent, and share the peaks and pits of parenting. But given a choice between some strung-out mum’s blow-by-blow account of her boy’s vomit incident in the playground and this mum’s quiet restraint and obvious affection, I know which one appeals to me. Ihave one of this painting d-ont know anything about it please can you tell me any info of it looks it has on original frame and it is done on wood . Thank you hope to hear from you.